Like Donald Trump's execu-mullet, the Rolls Royce-amino is business up front and a wild party out back. There are two for sale on eBay right now, meaning it's finally your chance to hold the most ostentatious Home Depot hauling ever. Built by customizers for customers with conspicuous taste and big pockets, no one knows how many Rolls-Royce-aminos and we'd have guessed the number was in the two-digit range until we found two for sale at the same time. The first model, for sale in Ft. Lauderale, is a 1972 Silver Shadow II converted into truck duty with a covered bad in a stunning white. It's erroneously and hilariously advertised as "THE ONLY ROLLS ROYCE PICK UP IN THE WHOLE WORLD." Not quite, but the RR is in amazing condition considering the driving habits if someone who needs/wants one. There's a buy-it-now price of just $39,950, which compares well to a new F350 Lariat. The second model is a 1969 Silver Shadow in a rich black for sale in Minnesota. This is the true collector's item as the car was owned by artist/sculpter Bill Mack. 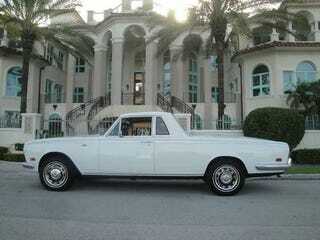 This one also is advertised as "the only known Rolls Royce Pickup Truck in the United States, possibly world." Error aside, the car possesses a more detailed lineage, including the revelation it was put together by Foreman Motors of West Palm Beach at a cost of $100,000. The bed cover isn't quite as nicely constructed as the white version, but it's still totally classy. It's listed at a buy-it-now price of $64,900. It's a great deal because for $125,000 you can own two identical cars the owners insist are one-of-a-kind. Hat tip to Michael and Zac!